En route, near Sonamarg, we witnessed an overwhelming sight. From a viewpoint called Zero Point, we looked down and saw thousands of tents pitched along the River Drass. This encampment was a makeshift arrangement for the Amarnath pilgrims who had chosen this route over the usually followed Chandanwadi climb. As my friend Kuldip mentioned, this scene was an unusual combination of faith and fury. The next day saw us driving towards Leh. Our first stop was Mulbekh (altitude: 10,839 ft.). Mulbekh is known for its 8th-century Chamba statue of Maitreyi Buddha. It is one of the more revered sites for the Buddhists of this region. 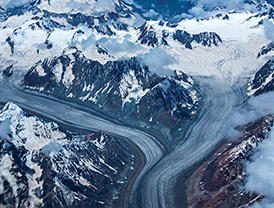 Our next stops were the two passes on this route – Namika La and Fotu La. Both equally scenic! Incidentally, Fotu La is the highest pass on Srinagar-Leh Highway. 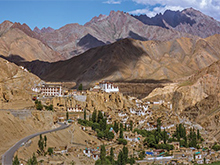 By lunchtime, we were in Lamayuru Monastery (altitude: 11,520 ft.) – one of the largest monasteries in Ladakh. Over 150 Buddhist monks have permanent residence in this monastery. 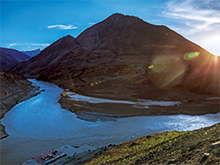 Before reaching Leh, we made two more stops – the Indus- Zanskar confluence and the Magnetic Hill. The next day was our acclimatization day in Leh. Also, it was the day for the organisers to plan for the big event in Khardung La! Most of us took it easy catching up on social media and emails since we got access to Wi-fi after many days. For those who may not know, the Internet access in J&K is restricted often because of security reasons. Some of us visited Thikse Monastery and Vishwa Shanti Stupa. 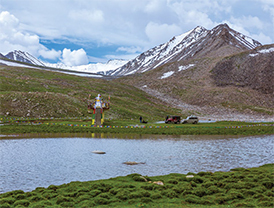 These places are within a few kilometers of Leh. 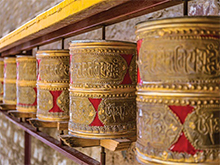 And these rank high – both, as Buddhist as well as tourist attractions. Next morning, armed with skullcaps, sunscreens and earmuffs, we were to make our way to Khardung La. Here it was – the big day! For some of us who were to return after the meet, it was our last day with the group. ScoutMyTrip and OYO Rooms had immaculately planned this day. While all those who were proceeding to Hundar (Nubra Valley) after the meet loaded their bags, we just hauled ourselves out of our respective rooms and loaded ourselves into the vehicles. During our drive to Khardung La, we gave lift to a bike’s pillion rider. 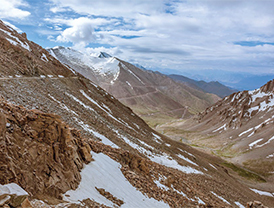 Their bike was groaning with the strain of the steep climb to what is touted as the highest motorable road in the world! At Khardung La, after some photo clicking, the meet started at the signage that marks the highest point of the pass. The cor e of the discussion here was the record setting we were all involved in. After being there for the permitted 20-30 minutes, we all moved the venue a little away from the narrow mountain pass. Our discussions continued at the Tsolding Buddha Park, an idyllic location that had a Buddha Temple and a small rivulet. 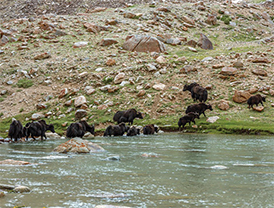 As soon as we reached there, we spotted a dozen or so yaks crossing the little rivulet! Though we had climbed down a bit, the air still was rarified. While we chatted about the various blogging related issues, some helping hands cooked Maggi for us. Here, OYO Rooms unveiled a unique programme for bloggers – OYONauts! This programme helps bloggers stay with OYO Rooms free of charge so long as they share their experience of the stay and being in the city on their blog. After spending another 90 minutes here, the meet ended. 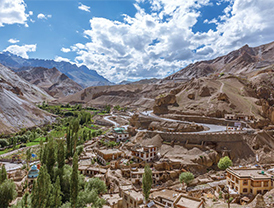 Those w ho were proceeding on the road trip from here to Hundar, Pangong, Tso Moriri, Keylong, Manali and Gurgaon got into the #HighestBloggerMeet SUVs and continued, while the others made their way back to Leh in taxis, to get back to Delhi. It was the 16th of July 2017! While I returned to Delhi on 17th, the entire set of bloggers who were on this record-creating odyssey reunited once again on 22nd July in Gurgaon. This was a big day! 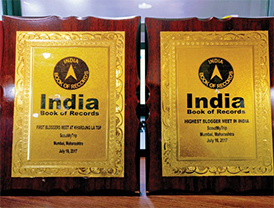 Ashok Kumar Sharma, Editor of India Book of Records was there to curate whether a record had been created. While we waited with a collective baited breath, he announced that we had created not one, but two records – the first-ever bloggers meet in Khardung La, as well as the Highest Blogger meet at an altitude of 17,562 ft.